The exciting conclusion to the series’ first Tale of the Resistance has finally arrived! Read it right here! As Rouge finally begins to settle in to her life among the Anti-Rebellion, she thinks back to the days when the fate of the entire world rested on her ability to fool some of the very same people. How was Sonic found on the Death Egg? How did Shadow escape? How did Rouge make it out alive? Well…I’ve dedicated about six straight, no-distractions, nearly-uninterrupted days into writing this episode. I reached 14,000 words before I realized that there was simply no reasonable way I could publish this as a single episode. Even though I really wanted to. Seriously, this season doesn’t have room for any two-parters. So I guess I’m just expanding the season. Needless to say, this episode wasn’t exactly supposed to end where it did. It wasn’t exactly a cliffhanger, we all know what happened to Shadow in the end. But, eh, it was dramatic, and roughly in the middle. It is sort of nice now that I have the two separate “Episode Shadow from another perspective” and “the rest of Forces from another perspective” episodes. This episode was originally supposed to be just the latter with a brief Episode Shadow based introduction, but, much like Vector, I guess I just got too caught up in the story. So that “brief introduction” basically became an entire episode of its own. I suppose I should probably explain the whole “Tales of the Resistance” thing. Sonic Forces is…incredibly unique in the way that it handled its story. Yes, I know, that’s a pretty funny way to say “terrible”. But that’s the thing. Generally speaking, Sonic game stories tend to fall into two categories. Either you have something like the Classic games or Lost World or Colors or something, where there’s a very loose, simple plot that is presented as it is with no questions to be asked, or it’s something like SA2 or ’06 where the plot is complicated and presents lots of questions, but is still designed to be self-inclusive and answer those questions for itself. But Forces is different. Forces presents this grandiose plot, one of the biggest in the franchise, but then leaves 90% of it up to your imagination. And when it comes to Sonic, I have a very active imagination. So that’s why I’ve decided to work on this sort of…subseries to take place within The Chaos Project. The idea is not to rewrite Forces, but simply to tell the stories that Forces left out. In fact, the Forces special I wrote nearly a year ago, After the Fight, would probably be considered a part of this subseries as well. I did consider writing this as its own separate story, instead of making it a part of The Chaos Project, but…why should I leave these things separate when they stand to benefit from the context of each other? Plus, as you may know from Shadow of Time, I don’t exactly have the best track record when it comes to reliably working on non-Chaos Project content. I’ll probably compile it all on the website with C.P. content removed anyways. One of the reasons I love this part so much (and why it dragged so much longer than expected) is because I couldn’t pass up the chance to reimplement some nearly-canon yet lost material of Forces. To most of my readers, half of the dialogue during the Virtual Reality novelization was probably completely unfamiliar. But all of it (right up before the end) was actual dialogue programmed into the real Episode Shadow, but left inaccessible for unknown reasons. I might’ve mentioned this before, but Shadow’s line “I thought you said he was destroyed three months ago…” was one of the most spectacular deliveries I’ve ever heard from this voice actor of Shadow. But they cut it out. So to spite them, I put it back in. Even at the end, once Shadow started talking about “Showing them Ultimate Power,” those were cut lines as well, although they seemed to be intended for Eggman’s Facility (possibly implying a cut Jackal Squad fight, curse you Sonic Team). In general, Tales of the Resistance is expected to be full of such references to cut content, little-known trivia, and even some unused concept art, as you will be seeing right at the beginning of the next part. In terms of the “little-known trivia,” I should probably mention that the first flashback scene, of Rouge coordinating Shadow’s run through Enemy Territory while Omega deals with Infinite, was actually, for the most part, straight out of one of the official Sonic Forces prequel comics. But that’s not the trivia part. What’s interesting is that that particular comic, “Looming Shadow,” ended with a brief exchange between Rouge and Shadow which was entirely missing from the original game, despite the dialogue otherwise lining up perfectly. That would be because that ending exchange was, you guessed it, made up of lines that are programmed in but cut from the final game. It’s hard to say whether the comic writers actually saw a beta version of the game where those lines were used, or if they were simply given a bulk script to work with before anything got cut. But the way I see it, I’m simply doing the comic’s work. Only better. Eat your heart out, Ian Flynn (not really I love your work plz don’t be mad). Coming back to the episode as a whole, I would say this one in particular was inspired by a few very specific questions. 1) What the heck happened at the end of Episode Shadow that made Rouge call Shadow over? 2) Why the heck did Episode Shadow end showing Sonic being defeated by Infinite without any additional context of any kind? What was the significance of that scene? 3) WHERE THE HECK WAS SHADOW OVER THE FOLLOWING SIX MONTHS!!?? Seriously! They dedicate an entire prequel story to Shadow, and they don’t even bother answering the one question about him that was actually posed by the main game? What were they thinking!? Over all, the ending of Episode Shadow was severely, severely lacking. It’s almost like they decided to cancel the second half so they could get it out in time for day-one DLC. IT’S ALREADY DLC!! YOU MIGHT AS WELL JUST TAKE THE TIME TO PUT ACTUAL WORK INTO IT!! Sorry. Anyways, two out of three of those questions were definitively answered by this first part. And that brings me to the Battle of Lost Valley. Green Hill was one of the many, many things in Forces that everyone reacted to, but never actually talked about. Why is it covered in sand? Why is it inhabited by an alien worm from the Lost Hex? Why is it littered with the scattered remains of Death Egg Robots? These are things that everyone points out, yet no one ever bothers answering. For these questions, I got one out of three. It’s a start. Writing the Battle of Lost Valley was immensely satisfying, just because it answered so many questions. It explains what Rouge saw at the end of Episode Shadow. It explains where the Death Egg Robots came from. It even explains where GUN went for the duration of the game. To top that all off, it gives the sand worm an actual purpose, and ties Episode Shadow quite neatly into the main story of Forces. And I suppose that’s all I’ve got for this part! The first in a new Chaos Project sub-series is here at last! Tales of the Resistance begins right here! Rouge has joined Infinite and the Anti-Rebellion. Three years ago, she once did the same. How did Team Dark survive the War to Take Back the Planet? On Empire Day, a great battle was lost, and Rouge fled from the Rebellion to work for their enemies. But years ago, on the day that Infinite attacked, something similar once happened. Shadow lets out a grunt of discontent, as if thinking deeply about something. “I can’t imagine the Doctor would do something like that without…” He trails off. Shadow’s voice can faintly be heard through the crackling static of the comm. “W––t –s i–, Ro–g–? W––– h––pe––d?” The voice is completely lost. Infinite spreads his arms wide, and a massive wave of negative energy sweeps over the entire battlefield. Soldiers are lifted from the ground, tumbling uncontrollably through the air, and flying mechs seem no longer able to keep control, plummeting towards the ground. All of the airships aim their fire directly at Infinite. He chuckles softly as the vast majority of the fire passes him by completely. He points up an outstretched hand, and fires off a thin crimson laser beam of his own. Though the beam is thin, it wreaks massive destruction as it carves through the entire fleet one ship at a time, sending them all diving down into the negative space. Infinite lets both of his arms drop down to his sides. In the air around him, countless hundreds of cubes are generated, each floating independently. He stretches back, then crosses his arms in front of him. One by one, in rapid succession, the cubes are launched away from him at immense speed. Each one seems to target a person or a machine. And each time one comes in contact, it appears to erase its target from existence in an instant. From a perch high atop a cliff, away from the chaos, Rouge watches in horror as hundreds upon hundreds of soldiers appear to be annihilated before her eyes. Even the falling airships are removed. Suddenly, the bubble of negative space contracts. There are no more cubes. And no more sign that GUN was ever there. Save for the wrecks of the Death Egg Robots, and the Egg Pawns quickly taking up defensive positions throughout the lost valley, there is no sign of any battle at all. The rest of the Eggman’s forces surge onwards towards the city. And it’s done! 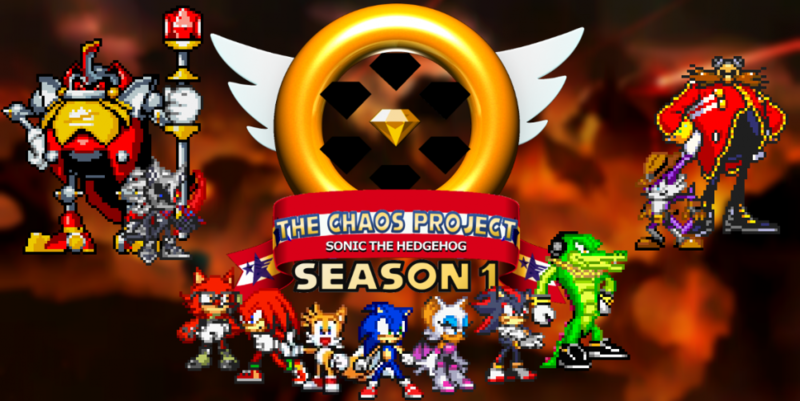 The mid-season finale of The Chaos Project Season 1! Yes, that means this season’s going to be quite a bit shorter than the last, but Season 0 was always supposed to be a special case. And actually, I’m really liking this 16-episode format so far, it gives the perfect amount of focus on the episodes that matter, while leaving just enough room for the occasional fun filler episode. But, on to the episode itself. Obviously, I’ve been waiting to do this one for a long time, it being a turning point for the season and all. But that really only applies to the second half of the episode, as the event that would lead up to Rouge leaving was always left vague in my plans. It was by a series of coincidences that I ended up going with the 4th of July date. During early planning for this Season, this episode was actually going to be in early June, but about four episodes in, I decided to accelerate my plans for Sonic’s Birthday episode so that I could get Big in a bit earlier, which meant this one had to be at the end of June or later. I decided early July would leave a good amount of time between this episode and the last, and the 4th, obviously, was the first early July number that came to mind. Before I discarded the date for that reason, it occurred to me that I could have some irony, having the Rebellion take such a big loss on a day of independence. It was around that time, on an entirely separate train of thought, that the timeline of Sonic Forces came to mind. Six months Sonic was out of commission, plus three days for Eggman to execute his big Sun plan, applied to the start date of this new war, January 1st, makes July 4th. It was too perfect. So I went all-out with the Empire Day thing from there. Even so, the details of the big fight weren’t set until well after I had written this episode’s opening scene. Which means, Sonic’s fight with Infinite on top of the balloon floats was actually inspired by my own showcase of a balloon float on the news report at the beginning. I had only done that for something that makes sense to see, I was only planning fireworks at first, but you obviously wouldn’t be able to see those before the actual event. Of course, I was also inspired by a Spider-Man movie, which had a similar balloon float fight scene that I always thought was really cool as a kid. I think I captured that kind of action really well, even for the relatively short fight sequence. I should, of course, mention the fact that I’m perfectly aware 4th of July is a specifically American holiday. There’s not much reason for anyone else in the world to celebrate it, and there’s even less reason for it to be celebrated in the Sonic universe. That’s why I had to be very careful in the way I phrased things. It was never stated in any way that the date had any significance beyond what Eggman had given it. But if you should happen to celebrate the holiday, then you’re very likely to agree with Sonic’s sentiment of it making you sick, just for considerably different reasons. And…I guess that’s all I really have to say. Surprisingly short for such a long and important episode. From here, I may be going on a brief holiday/mid-season break, but then again, there’s a certain date I’m trying to make for a special episode coming soon, so episodes may actually be coming out even more rapidly than usual. We’ll have to wait and see. Well, as much as I’d love to do an animated preview for every episode, that last one took almost as long to make as the episode itself, and that was supposed to be an easy one! If I kept making those, I wouldn’t have any time left to actually write the stories they’re trying to tell! So, for now, it’s back to the old, boring, block-of-text previews. That certainly doesn’t mean that I’ll never do another animation again, it just might be a while. We’ll have to wait and see. And so, without further delay, I give you the preview for the very first Mid-Season Finale, coming one week from today! Down on the streets, citizens of many races and species are gathered in great lines down the sidewalks, staring up silently as confetti rains down from the sky. Speakers loudly blare a familiar yet strangely upbeat tune celebrating the Eggman Empire, and the sound of cheering can be heard as the first balloon float approaches between the skyscrapers, depicting a more classic appearance of Eggman, even blown up in a familiar pose. Despite the odd cheering, there don’t seem to be many happy faces in the crowd. Large digital screens hung up on the walls of buildings show zoomed images of what appears to be the same crowd, though that digital crowd seems unusually excited. Several of the real people in the back rows give an occasional nervous glance back at the guard robots stationed periodically behind the groups of people, weapons raised raised up to their chests as if prepared to fire on a moment’s notice. One robot is suddenly drawn back into the shadows in a blur, and the sound of crunching metal can be heard. No one seems to notice. A few moments later, another disappears in the same way. This time, just a few people manage to see. Whispers quickly begin to spread through the crowd. The guard robots start to scan around on high alert, but still they disappear one by one, some hit with weapons, others by more direct attacks. By the time the second float approaches, depicting the Egg Mobile carrying a large checkered ball on a chain, there’s a clear excitement and confusion amongst the crowd. And that’s when Sonic appears on top of it. The members of the Rebellion, now spread throughout the crowd, start to cheer. The rest of the crowd quickly joins in. “You can scatter like insects to avoid a far worse fate.” Infinite’s voice projects through the streets just as loudly as Sonic’s. “Because your little blue savior won’t be saving anyone today.” Infinite descends down to stand on the float across from Sonic, caught on the cameras for the whole city to see. On the streets below, the members of the Rebellion step forwards amidst their crowds, cheered along by the citizens around them. Heavy King slams down onto the street in front of Knuckles and Hero. Citizens immediately begin to scatter, screaming in terror with the new danger so close to them. But he is also not alone. Heavy Rider zooms through the streets, skidding to a stop in front of Amy and Tails. Heavy Gunner jets through the air, drifting down with weapon pointed at Shadow and Omega. Heavy Shinobi leaps in to cut off the escape route of Vector and Espio. “Hmph.” Sonic wipes across the bottom of his nose, and takes off at a run, leaping from the float in a Spin Attack. The Battle of Empire City has begun. But something far more sinister lurks behind. What is the Anti-Rebellion planning? And where’s Heavy Magician? Well, this one took a lot longer than I was hoping, but it’s finally done! There was a lot that went into this episode, so I’m trying to think of where to start. I knew from the moment I learned that the Jackal Squad weren’t featured in Forces that I would want to dedicate an episode to them at some point. At the time, I didn’t imagine it would be quite this soon. And a hitch came in the plan when I realized that the general consensus was that Shadow had killed them all. I mean, sure, “destroyed the entire squad” certainly could imply that, but Shadow’s no mass-murderer…right? And I’d already written into Forces of Chaos that Infinite knew they were alive, but didn’t care about them. (That was totally meant to lead into this episode, by the way.) I got around this problem by suggesting that Infinite did think they were dead at the time, but learned the next day that they weren’t. And you know, there were more than just the three Jackals in the squad besides Infinite. They’re nowhere to be seen in this episode. Perhaps Shadow really did kill the rest of them? I intentionally left it very unclear, and it could simply be that Seth, Colm, and Tana were the only ones willing to go back to the squad after Shadow’s attack, and all the rest just ran away. Whichever makes you feel better, I guess. Let’s move on to the members of the squad, I suppose. None of them were given names…or personalities…when they originally appeared in the prequel comic. But these three are the same three who appeared most prominently in that comic, and most of Seth’s monologue was dedicated to explaining that fact. It was kind of fun, taking these nameless nobodies and turning them into real characters. I’ve seen it done by others before, and it’s interesting to see how our interpretations differ. And anyways, Seth was the closest to getting something along those lines, as he was featured right alongside Infinite in that comic, and even had a single spoken line. Based on his more eager, energetic facial expressions, and the similar inflection I interpreted from his single line, I came to the conclusion that he’s maybe a bit younger than the rest of them, but his closeness to Infinite showed that he was still most likely his second in command. I built the character based around those two observations. The result was a surprisingly optimistic personality, an interesting contrast to Infinite himself, belonging to someone who considers Infinite to be his closest friend. Perhaps they even had a sort of darker, more twisted version of the brotherly bond shared by Sonic and Tails. Maybe I’ll dig into that a little in a future episode. Something you, in all likelihood, probably didn’t notice, is that there was a pattern to the names I chose for these three members of the Jackal Squad. They all share their names with playable characters from a game called Fire Emblem: The Sacred Stones. They don’t have very much else in common with these characters, just the names. Part of the reason I did this has to do with a scrapped idea I had for Infinite. When contemplating what his name should have been before he became Infinite, one of the most prominent ideas that came to me was “Innes,” which means “small, secluded island,” and of course, begins with “In” just like Infinite does. Innes also happens to be the name of a Sacred Stones character. There’s also another reason I was considering Innes, but I’ll get to that in a moment. Anyways, I liked that name, but I liked Finn even better, where “Fin” literally means “end,” the opposite of Infinite, and is also derived from the “fin” in “InFINite.” So, that was going to be it, and this episode was going to have nothing to do with Fire Emblem. But I still needed a name for Seth and the other Jackals. And that brings me to my next point. This episode was strongly, yet loosely, inspired by Egyptian mythology. The connection was sort of already there for me. Jackals are important figures in Egyptian lore, strongly associated with death due to the real life problem of jackals digging up graves. And Infinite’s very earliest appearance involved him raiding a pyramid, which are well-known to be used as the tombs of Egyptian Pharaohs. In other words, Infinite was doing exactly what inspired those Egyptian myths. They even gave him a middle-eastern style curved blade. Throw in the Phantom Ruby, and you have a clear connection to the jackal-headed Egyptian god of the dead, Anubis. That was the angle from which I decided to work this episode. Having it take place in a pyramid was an obvious choice from there, and I figured the pyramid from SA2 would simply be a more creative choice. Anyways, one of the reasons I liked “Innes” as a potential name was due to the fact that it has a similar sound to “Anubis,” driving in that connection further. But I liked Finn too much to let it go. And then there’s Seth. Seth is an alternate pronunciation for Set, another Egyptian god. Set did a lot of…interesting things in Egyptian lore, but one of the more important things he did was teaming up with Ra, God of the Sun, to slay Apophis, the Serpent of Chaos. (Now that sounds like something that can be tied back into Sonic. So who in the Sonic universe made a Sun, who could team up with Seth? And who would that make Apophis? You may have to wait until Season 5 to find out.) Point is, much like the rest of this episode, Seth is inspired by that mythology. But wait, didn’t I say Seth was a Fire Emblem character? That I did, yes. Between the coincidental near-use of Innes and the definite use of Seth, I decided to roll with that reference, and name Tana and Colm after those characters as well. Lyon, the ex-member of the Jackal Squad who died, was also named similarly, and he even shares a bit in common with his namesake…in the fact that he’s dead. Spoiler alert! I think it’s finally time to move on to other things. Before the Jackal Squad was ever involved, this episode was planned to be a team-up with Shadow and Hero, since Hero didn’t get a proper spotlight in his introduction episode, and Shadow, the second main character of the series, has been lurking in the background this entire season so far. And I realize that with so much focus on Seth, that got a little bit lost. I realized that with a third character in the mix, Hero, being mute, would be hard-pressed to get enough screen time, since Shadow and Seth would be able to keep talking to each other. With that in mind, I made sure to kick the episode off with a sweet little character moment with him and Bruno, so that he didn’t just seem like a flat, pointless character the entire time. This is probably the first time I can say that Bruno was pretty much totally useless, but now that I’ve written him in, I’ve got to stick with him. Anyways, Hero and Infinite are supposed to have a thing going, that was emphasized well enough back during Forces of Chaos, but once again, with so much focus on Seth, that got lost this time around. At least he made friends with Shadow, even if that was kind of forced in at the end. So…there are three Phantom Rubies. And Shadow may or may not have promised to help Infinite find them. So why are there three? Well, why are there seven Emeralds? Why are there twelve Temporal Sapphires? Perhaps this is related somehow. We never did learn why Chaos and Ruby energy interact the way they do. Or what the Phantom Ruby really is. But now, we’re doing alright, and we’re on our way. -So until next time, remember to face every moment, day by day! There’s been a slight delay, but the next episode of The Chaos Project has finally arrived! Read it right here! Life isn’t easy for a band of mercenaries. Especially after the squad was nearly destroyed by Shadow the Hedgehog. But now, Seth the Jackal work with the last person he ever expected to team up with, if he has any hope of finding the member of the Jackal Squad who has been lost for far too long. If he’s even still alive. Oh, man. It’s hard to believe it’s over. I mean, The Chaos Project still has a long way to go, but Season 0, the backbone of the whole story, is actually over. It’s been two years. Two whole years! Ten percent of my life, I’ve spent on this season alone, and now it’s over! Two years ago, if you had told me I would end the season on a cliffhanger battle between Blacklight and Infinite, I would’ve…well, first I would’ve asked who Infinite is, because Forces wasn’t announced yet, but then I would’ve called you crazy. Certainly, I would’ve been on, like, Season 2 at least. And certainly, if it had somehow taken me that long to end Season 0, there’s no way I would’ve dedicated such an important episode to concepts from some bland Modern Sonic game that no one likes. After all, the stories of Modern Sonic games are specifically what I’m writing this story to combat. And yet, here we are. I guess you just never know what life’s gonna throw at you. But hey, make your move, work it out, that’s what life is all about. It’s an adventure. And somehow, through it all, it still leads into Crisis of Chaos in exactly the ways I wanted it to. I suppose I should probably explain that ending scene itself. The idea didn’t occur to me until some time during the writing of this episode, but I thought that, given the way this whole arc started, and the innate similarities between Infinite and Blacklight that have been drastically strengthened by the Ruby connection, their relationship needed better resolution than the climax offered. Man, where do I even go from here, talking about this episode? SO. MUCH. ACTION. This was really testing the limits of my action-writing skills. I suppose that explains how this ended up being far and away the longest episode of this season, likely of the entire story. 14,000 words, where 5,000 is where I like to be, and 11,000 was the record set just one episode earlier. Dialogue is very efficient, one word of dialogue translates fairly well to one second of screen time. But for an action sequence, two or three sentences, long ones, could be necessary to describe just a quick few seconds of equivalent on-screen motion. Anyways, I suppose I should start with the actual episode content now. I already mentioned in last episode’s review that that episode was like the “character finale,” while this is the “action and plot finale,” and that ended up holding pretty true. But what I didn’t say was that, while last episode was specifically for Shadow and his little group, this episode was for everyone. Usually I like to identify who the main characters for each episode are, and by my normal evaluation method, that would include pretty much the entire Sonic cast this time (the exceptions being Silver, Blaze, Classic Sonic, Zero, and arguably Sonic himself, plus spin-off characters like the Babylons). For such an important episode, I think that’s pretty fair. Since it actually took up a pretty fair percentage of this episode, I suppose I should talk about Cream’s little character arc. I promised it would happen, and I think I delivered. In the end, she didn’t really “handle herself” as well as I’d hoped, but I also wanted to make sure to keep things within her established character. Fun fact; I was originally planning on having her actually accept the gun from the Commander, or maybe end up being forced to use his, but in the end, I realized that was kind of…wrong, to put a gun in the hands of a seven-year-old. Hence why I had to talk about the safeties in the gun to have the Commander offer the weapon in the first place without seeming like a terrible, terrible person in the process. The culprit, I think, for making me think it was okay before I came to my senses, is Ender’s Game, a sci-fi novel about a child sent to wage war against an alien race. You might remember it for the terrible movie it had a few years back, but the books are great. Anyways, the idea of a kid with a gun didn’t seem so crazy to me in light of that, but I realized that not everyone would agree with that assessment. But anyways, those scenes were also nice because I got to give the Commander a proper character arc, even if only a small one. I’ve been painting him as such a jerk throughout this series, but I do really like him as a character, so it was very nice to show his more caring, protective side. Not to mention his skills as a soldier, since he’s usually on the sidelines. Before our next topic, I’d like to confirm that Heavy Shinobi is not dead. I just wanted to prove a point about Infinite’s brutality, which I think went quite well. Since I just mentioned soldiers, I guess I’ll move on to Hero next. I knew right from the beginning that I didn’t want to pull another fake Super Form with him like I did in After the Fight, but I also knew that he was much too important to this episode arc to be relegated to lesser fights. So, recalling the fact that Titanic Monarch was a Zone before it was a final boss, I thought that having Hero traverse that Zone in the middle of Shadow’s Super fight would be a great way to show off the sheer scale of the Monarch, while also giving him a great opportunity for a final interaction with Infinite. Of course, this planning was all before I was even done with After the Fight, so their entire thing they had going back then was all for the purpose of leading up to “I don’t want to see you burn.” Essentially, that was Infinite’s way of saying “I care about you,” which is insane for him, but that’s why I had them spend so much time together over the course of this arc. And then of course, Hero said his first words! Sort of. “Nuh-uh” aren’t exactly words. I originally planned on a more resolute “No,” but I was advised against such a drastic move at this time. Doesn’t mean he won’t say more in the future, but as his very first semblance of speech, something a little more like how he usually expresses himself seemed a little more appropriate. And of course, we have his resolution, becoming a proper GUN soldier. I mentioned this before, and I know that it felt rushed, almost out of the blue, but I couldn’t have him talk about it! The best I could do is hint that he’d be without a purpose after the war, and show that he has a respect for the Commander. Honestly, I think it’s a pretty reasonable step for him to take, given his character arc in Forces alone, but since it’s technically your custom character, I can see why anyone might disagree with that. I guess I’ll talk about my shames of this episode now. Probably the biggest was how much Tails was shoved off to the side, considering that he was technically the first main character of this arc. Before Forces ever came along, this arc was intended to form a pretty important bond between Shadow and Tails, and I’ll admit that that part got completely dropped halfway through. I’ll just have to move the building of that relationship off into next season (or maybe the one after), which is fine by me. I can still use the early episodes of this arc as a foundation. But anyways, it’s actually pretty sad that Cream got more of a focus in this episode than Tails did, but in the grand scheme of things, he really just wasn’t that important, and I didn’t want to force anything. Next up is the Super fight. It was meant to be…a lot more exciting. But as you could probably tell, I gave up on actually describing most of it halfway through, and instead just implied that stuff was happening while they were talking. The problem is that the Monarch itself had a giant, blaring, fragile weak point, one hit and it’s over, which made it a lot harder to keep interesting. Not to mention the fact that the episode was intended to be much shorter, so one battle spread throughout all of it wouldn’t have seemed so dragged out that way. There’s one last disappointment, and it’s a small one. Considering that Bruno the Wisp is technically the only original character I introduced in this arc, I would’ve like for him to be…at least a little bit more important. I mean, he served his purpose, he gave Hero a way to communicate with others, he armed the Wispon when necessary, and he showed off character from Hero in that he’s less secure without him. And of course, he had a few entertaining interactions with Infinite. But he himself didn’t gain much in the way of character. Oh, well. And…that’s really all for disappointments. I’m quite fond of this episode over all. I could probably keep talking here for hours, as seems to be becoming the norm. But I think I’ve covered all the most important parts. There are quite a few things I sort of intended to talk about, like more about those three ending scenes, but I think I wrote them in a way that each speaks for itself. So I guess this is where I’ll stop. So now is the time for another big announcement. I can now confirm that I will publish the premiere episode of Season 1 on June 23rd, the second anniversary of the story, and Sonic’s 27th. That’s next week! No need for a long seasonal break! (Though there may be a summer hiatus thereafter.) So keep an eye out! -And until then, remember to live and learn every day!